Each year, hundreds of thousands of people come together to participate in breast cancer walks and runs across the U.S. Since the first breast cancer walks began in the 1980s, they have become one of the most common ways for people to try to do something about breast cancer. Some of these walks have become huge affairs that are hosted by multi-million dollar charities and sponsored by multi-billion dollar corporations that raise millions to “end breast cancer.” And yet each year, 250,000 women are diagnosed with breast cancer and 40,000 women die of this disease. 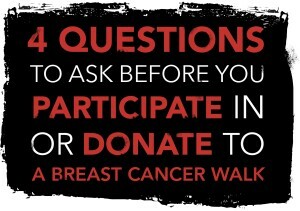 If you want to be sure your time and money are truly making a difference, here are four questions to ask before participating in or donating to a breast cancer walk.